After graduating from Bryn Mawr, Meagan Perry Occhialini ’00 attended Gettysburg College, where she majored in political science and also played field hockey. 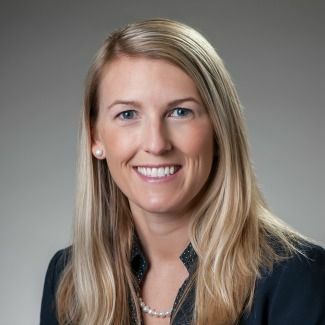 She joined the financial services industry, working first with John Hancock Life Insurance before moving to Sun Life Financial in Boston. She has stayed connected to Bryn Mawr, most recently serving on the Reunion Committee for the Class of 2000. What I learned at Bryn Mawr, and the philosophies and the support that I was given there, have been by my side throughout my professional career, especially with my beliefs about women in the workplace and feminism. I find that even today, that’s a topic so many young people are uncomfortable with. People in my office, especially the younger people, are scared of the words “feminist” or “feminism.” I definitely don’t feel that way, and I think it’s the way that we were brought up at Bryn Mawr. I decided to go into a career in financial services because of the challenge it would bring. It was really outside of my comfort zone, which I liked, and there was also a huge opportunity to be successful as a female. The confidence that Bryn Mawr provided me during high school and before gave me some of the steps to be successful, particularly in a male-dominated environment. For the past four years, I have been an executive board member for the Women’s Leadership Network in my office, and every time we meet, I think quite a bit about my experience at Bryn Mawr and about the fact that I’m still continuing to work with the philosophies that were taught to me at such a young age. There is definitely never a week that goes by where I don’t leverage the building blocks that I gained during my time at Bryn Mawr.